Sacred Heart won its fifth straight NVL tournament crown by defeating Torrington Wednesday night. 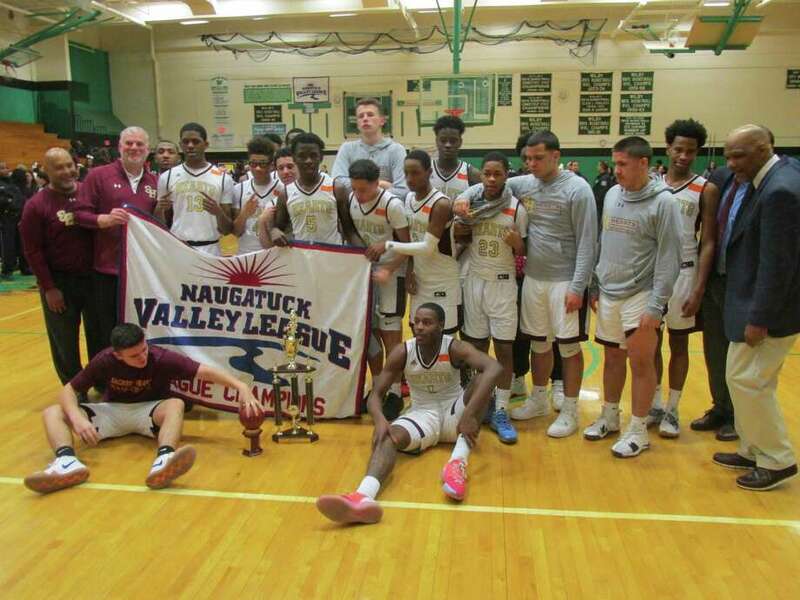 WATERBURY — Top-seeded and top-ranked Sacred Heart tucked away its fifth consecutive NVL Tournament Championship with a 75-54 win over No. 3 Torrington Wednesday night at Wilby High School. Torrington coach Eric Gamari couldn’t agree more. “They cover us better than anybody we’ve faced this year,” said Gamari, whose team pelted Crosby with 13 3-pointers in Monday’s semifinal, but banked just three on Wednesday. Even the Heart’s Jamaal Waters, sharing game scoring honors with Torrington’s Tyreek Davis at 23 apiece, buys into Carroll’s philosophy. The Red Raiders stood up well to the pressure, along with the constant threat of blocked shots from 6-foot-11 sophomore center Connor Tierney. Tierney blocked three first quarter shots under the basket, but the real opening story was a warp-speed duel between Waters and Davis. Davis had eight of Torrington’s 12 points for the period. Waters had all but two of Sacred Hearts’ 13. The Hearts pulled away in the second quarter when their scoring spread out. Specifically, that’s where Sacred Heart’s really big men play. While Davis kept up his scoring assault with another 11 points, including a pair of improbable threes, the Hearts moved inside with major help from 6-5 Omar Rowe; 6-7 Waters; Tierney and 6-5 Nate Tabor (12 points). Lorenzo Washington (14 points) and Tabor each hit a 3. Nick Balducci’s 3 was the last of the night for the Raiders. Sacred Heart led 39-26 at the half. With Davis shutting down from fatigue and that blanket Heart defense by the third quarter, the Hearts were well on their way to their 105th straight NVL win. Dontae Thomas 1-1-3; Tyreek Davis 8-5-23; Joel Villanueva 3-3-9; Kevin Dixon 2-0-4; Nick Balducci 1-0-3; T.J. Calabrese 0-2-2; Matt Rylander 2-2-6; Justin Mattiello 1-0-2; Mohamed Traore 1-0-2; Totals: 19-13-54. Lorenzo Washington 5-2-14; Omar Rowe 3-3-9; Jamaal Waters 7-9-23; Connor Tierney 4-0-9; Nate Tabor 4-3-12; Caleb Sampson 1-2-4; Steven Alseph 1-0-2; Nyron Drunnamanio 1-0-2; Totals: 26-19-75. 3-point goals: T – Davis 2; Balducci. SH – Washington 2; Tierney; Tabor. Records: Torrington 17-6; 16-5 NVL. Sacred Heart 22-1; 21-0 NVL.